With Valentine’s day approaching, love and romance is in the air. One of the most important life lessons I’ve learned is that if you don’t love yourself, it makes it a whole lot harder to truly love someone else. No one would argue that relationships with others–whether romantic or otherwise–can be difficult, but what about the relationship that’s most important? The relationship we have with ourselves. Self love. In the holistic healing arts, we understand and preach that optimal health means a balanced body, both physically and emotionally. This means you have good energy, you digest well, you sleep well, you exercise, and you have balanced emotional well-being and healthy relationships with others. Maybe you have a spiritual practice. It’s my experience that we humans are always working on balancing at least one of these elements. After all, that’s what creates growth. Having struggled so much with food, self love, and self-acceptance for most of my life, I wanted to share with you my road to reconciliation with my body. First, a short background. I grew up raising and training show horses and attended a prestigious all-girls school in Nashville. 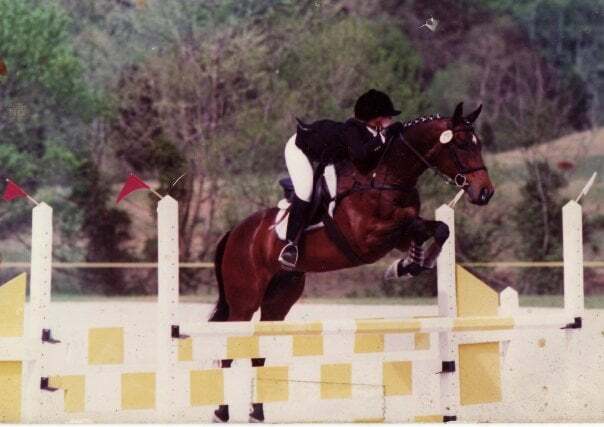 I was very fortunate to receive an excellent education and to grow up with such dedication to a sport that nearly took me to the Olympics (and my parents certainly knew what they were doing: horses were a full-time job, which left me little time for other teenage shenanigans). Me competing with Timer, my main squeeze, in 1992. But it came at a cost. After a brief stint modeling as a child, my parents got divorced. Soon after, my well-intentioned dad used food as a vehicle for us to bond when I would visit him on the weekends. We’d hit McDonald’s, and I’d have a Big Mac, large fries, and a chocolate shake. Then we’d hit Baskin Robbins for ice cream, and I’d have 2 scoops– Mississippi Mud and chocolate. I remember sneaking cookies from the cookie jar and hoarding them up in my room as a comfort. I was six years old at the time and growing– not only up, but out. 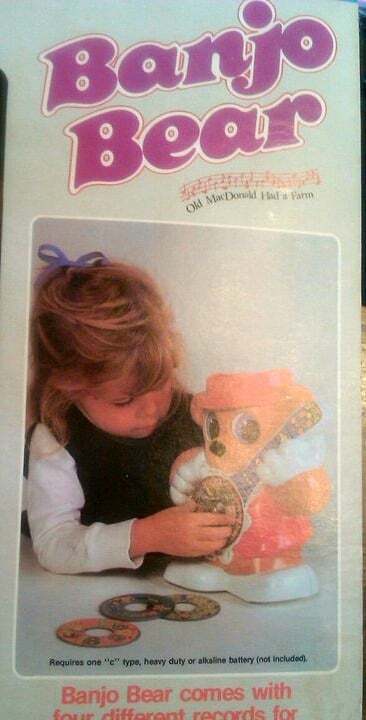 Me on the Banjo Bear toy box, my first major modeling gig, age 3. Growing up in the south, there was a lot of emphasis placed on attractiveness. As I got older, my parents began to mention that I should lose weight, so I went on my first diet at age 9. I started counting fat grams. That didn’t work, because I was still secretly binging on cookies and having dessert every night after dinner (usually chocolate cake, one of my faves). The pressure became more intense, and finally I was able to drop a significant amount of weight the summer before my freshman year of high school. Everyone commented on how great I looked after my weight loss, and it was a dizzying high. I remember feeling empowered that I could control my weight by reducing what I was eating, and it got me so much positive feedback. It made me feel good– the approval of others. That’s when the obsession really took off. My riding career was in full swing now, and I was competing at the upper levels, so it was important for me to stay fit. I became a vegetarian and restricted food. Living on rice and ramen noodles left me anemic. My ever well-intentioned dad would comment on my weight frequently, often asking me how much I weighed, or telling me I looked like I was holding my weight steady (or that I’d gained a few pounds). After all, he only wanted me to succeed. I dropped to my lowest weight, 120 (I’m 5 foot 8 inches) at age 16, right before my junior prom. At that point, my riding coach commented that I might have a problem with overly restricting food. And I loved it. I had finally succeeded– in being too skinny. I shudder now thinking about that. Naturally, it was too hard to keep that weight off, and I gained back 20 pounds before I went off to college. That was fine; I was still well within my normal weight range, but I felt chunky. Once I went to college, I studied hard– but I also partied hard, too. I discovered that alcohol was the perfect way to skip meals. And escape the self hate cycle and poor self esteem I was fostering. I could just drink through dinner and then I wouldn’t have to worry about eating. I was still a vegetarian and very interested in healthy eating, but I was also interested in hearty boozing. Fast forward to after college. I entered the work force and continued to obsess about food and being thin. I discovered wine was a great way to kill my appetite. I talked about how fat I was all the time. I was often met with looks of bewilderment, because at that point, I weighed about 135, and at 5’8′, that’s pretty thin. I got into a pattern of eating really clean and restricting food during the week, then I’d binge on whatever I wanted on the weekends. I always felt like crap on Mondays, but by Friday I’d be ready to do it all over again. I kept thinking: “If I could just lose 10 more pounds, I’ll be truly happy.” Nothing changed. This went on for years. Definition of insanity? In 2001, I moved out to San Francisco and started seeing a therapist to address some of the damaging issues I’d cultivated: that no one would love me if I wasn’t stick thin. That I’d be unattractive. That I really didn’t even love myself all that much. And what did that mean, anyway? Through it all, I punished myself, restricting food intake and pushing my body hard with exercise– runs that lasted too long, even when I was exhausted. I was overly critical and said negative and damaging things to myself. I drank and did drugs. It was a true feeling of being at war with myself. Once I started studying holistic nutrition as a career, my perspective began to change (with the help of therapy). Food isn’t the enemy–it’s meant to nourish us. And not nurture us. This was an important distinction for me, because after trying my hardest to restrict food during the week, I’d go crazy with pizza and ice cream on the weekends. That was my reward for being so “good.” Good at what? Keeping vital nutrients from my body? Naturally, all I could think about was food and counting calories and skipping meals, and the obsession is enough to drive anyone crazy. 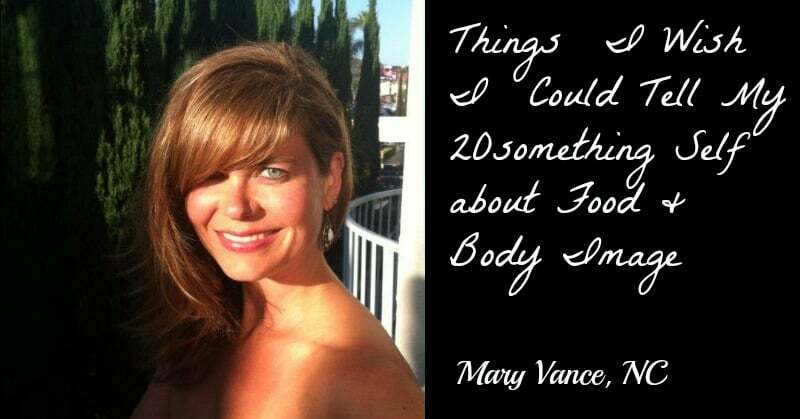 Now that I’m past my 20s and well into a career coaching others about nutrition and wellness, I still deal with body image issues regularly with my clients. As for myself, old habits die hard, but I am finally at a place of acceptance. I am in awe of what the human body is capable of– from its strength to its capacity to heal when given the right raw materials. There are a few things I wish had really sunk in for me when I was struggling, and I’d like to share them with you. Food is not the enemy. If you give your body the right amounts of nutrient dense foods–proteins, fruits and veggies, healthy fats–you’ll feel satisfied and energized. Eating skeletonized fat free fake foods only leaves you hungry and cranky and constantly thinking about food (so does starving yourself). When you get the right amount of food, you stop obsessing and start living. Your body’s set weight point may not be exactly where you want it to be. Everyone is shaped differently. 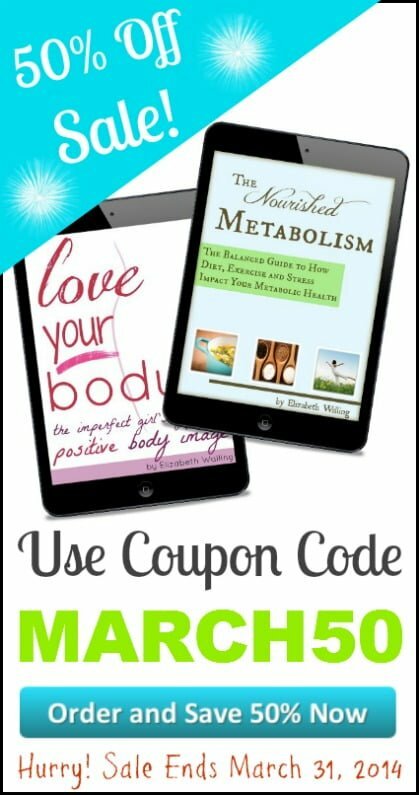 Your body has a set point within your healthy weight range. It may not correspond with the less than 5 percent of women who have a supermodel figure. And that’s ok.
Don’t compare your body to others. Most importantly, understand you are more than how you look. You’re cool, and that’s why your friends love you. Being at peace with yourself is something that radiates from within. Don’t fight your body. Work with it. Listen to it. It makes me feel sad when I think about how much I abused myself, both emotionally and physically. If you’re tired, rest. If you’re hungry, eat. Don’t punish yourself. You’ll only rebel in the end, and the guilt cycle starts over again. You are your thoughts, so don’t perpetuate the negativity cycle. I would repeat things to myself that I would never say out loud to a friend. Say something positive to yourself when you look in the mirror. Soon, the negativity will disappear. You are hardest on yourself. No one else notices if you have a zit or if you’ve gained 5 pounds. And you know what? No one cares. It’s up to YOU to make yourself feel good. Not anyone else. Don’t rely on others to build your self esteem. Here are some books that helped me. Maybe they can help you, too.